Beacon Falls, CT – December 12, 2016 – As 2016 winds down, Novo Health Services President and CEO Karl Fillip is delighted with how the year has progressed. 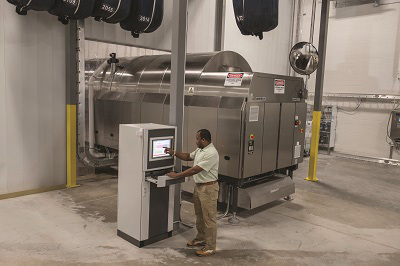 His young startup opened facilities last year in the Atlanta and Nashville markets, and those operations were fortified with new Lavatec laundry equipment that was installed earlier this year. Fillip credits an impressive plan of action and ongoing training that has produced some profound results. Novo Health Services' laundry supervisor Tony Davis, programs information into the new Lavatec tunnel system. "Lavatec has been very strategic in helping our startup go from nothing to 14 million pounds of laundry a year. They trained our team during the equipment and software installation, and they continue to train and audit performance to help us reach our targeted throughput," remarked Fillip, a seasoned healthcare linens veteran who became familiar with Lavatec equipment back in 2000. "Their tunnels, presses and dryers provide us with unparalleled value. Parts are quick to get and from tech to corporate support, it has been a phenomenal relationship." Each facility operates with a Lavatec 14-module, 132 lb. tunnel and a LP-series extraction press. Additional support comes through on the back end with both running five TT-series dryers and 120 employees who service 14 hospitals and 24 healthcare clinics in the Atlanta and Nashville marketplaces. The Atlanta plant is larger at 62,000 square-feet compared to 44,000 square-feet, despite the Nashville operation extending their reach east to Chattanooga and the I-65 corridor north into southern Kentucky. Lavatec has a reputation for building the most durable and reliable equipment for any size laundry operation. You won’t get an argument from Fillip, who says the simplicity of the tunnel and minimal downtime has contributed to his company’s success. But as VP Greg Cox points out, the amount of training provided at installation time allowed Novo Health Services’ staff to hit the ground running. "There was quite a bit of training involved. Some of our folks got to work directly besides Lavatec’s team during installation of the whole process," recalled Cox. "Another group of Lavatec’s came in to install the software and again, our team was able to participate, understand and learn. Since then, there have been ongoing training sessions where their technicians work with our people." Cox said the regular training sessions are proving to be extremely beneficial. "They usually come in once a month. Our team receives additional training and we get the opportunity to expand our knowledge. Lavatec audits the machines to make sure there are no issues and that usually takes a day or two. It isn’t downtime, it’s just to see how the dryer codes are working, if the timing is working properly, and how we can increase efficiency now that our volume levels are stable. "All of this was extremely important to us. Being a startup, many of our staff did not have a ton of experience with both laundry and tunnel system maintenance. So it has been really helpful with that extra layer of support. And if there is a little quirk here in between we can’t figure out, our people will pick up the phone and call them. It is a phenomenal and outstanding relationship." Fillip indicated the audit reports to achieve desired productivity levels were born early in the relationship. Some members of the Novo team were invited to visit the Lavatec factory in Germany to observe the equipment’s construction phase. "We watched the assembly to get a better understanding about how each piece of equipment was built. As far as productivity, during the audit reviews we are trying to increase our rate of transfers from 25 or 27 an hour. We’d like to optimize the machine and get to 30 per hour so we can match the performance warranties this equipment is capable of reaching." Cox reiterated how continuous training will help Novo Health Services achieve their goals. "Lavatec’s team looks at everything - product efficiency through the tunnel, the dryer times, back to the shuttle transfers - and following up with two days of intensive training for our people at both plants. That includes classroom instruction and on the job with the equipment." As 2017 approaches, Novo Health Services’ leaders are steadfast believers in Lavatec. "I can’t think of a better relationship we’ve had with any vendor. All of our vendor relationships have been strong, but Lavatec has been very forthright," added Cox. "They have honored their commitments and were very strategic in helping us start from nothing to creating 14 million pounds of work. Personally speaking, I can’t think of a business relationship I value more than the one we have with (Lavatec’s VP Sales) Keith Ware."